Juice the whole celery and freeze in big block. Defrost on top of cheese cloth over perforated tray with container to collect the defrosting juice. Once the juice is all extracted repeat the same process. Weigh up 400g of the extracted celery juice and set aside. Bring 1/4 of celery juice, sugar and salt to boil. Remove from heat and immediately add pre-soaked gelatin. Whisk to dissolve and add the remaining celery juice. Mix in the edible gold leaf. Pour into mould or container and refrigerate until required. Remove the tea bags and weigh up the infusion. Top up with more mineral water to get exactly 250g. 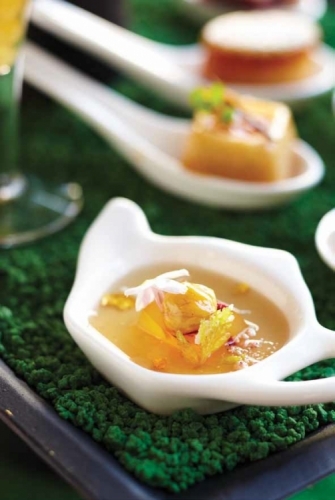 Combine sugar with 1/4 Dilmah Exceptional Fragrant Jasmine Green Tea infusion. Whisk to combine and bring to boil. Remove from heat and immediately add pre-soaked gelatin, whisk to dissolve gelatin and pour into mould or container. Toast the hazelnuts, remove skin and keep warm. Make caramel by bringing water, sugar and glucose to boil until caramel stage. Add the warm hazelnut and combine well to ensure even coating. Use fork to remove the hazelnut from caramel. Cool on marble and store in airtight container until required.